Looking for the best places to go and things to do when you visit the USA? Why not get a FREE copy of the 2019 Visit USA Travel Planner today. 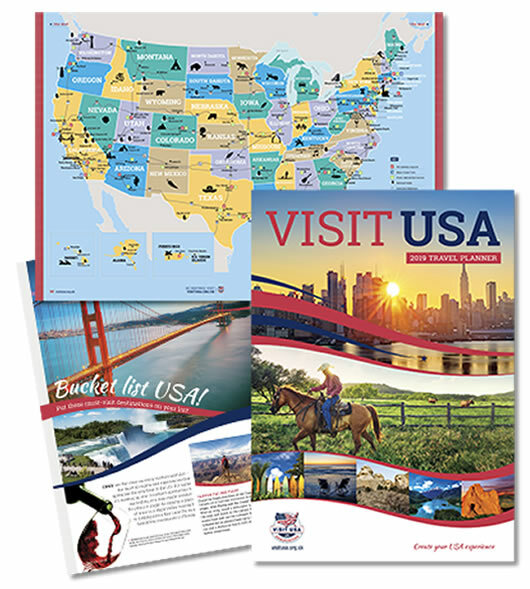 Request a printed copy or view the Visit USA Travel Planner online NOW. The travel guide is packed with 68 pages of exciting ideas, practical information, a US state guide, maps and useful contacts to help you decide where to go and what to do. 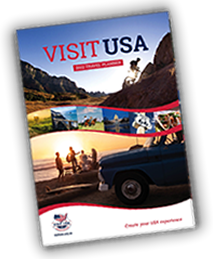 or if you prefer a printed copy of the latest Visit USA Travel Planner complete the form below. Your copy should arrive in the post within 5 days. The Visit USA Travel Planner is kept up to date to help you plan your trip or holiday in the USA, where numerous different destinations and exciting travel experiences await! Our latest guide will give you ideas on the best places to visit in America, from soothing spas to wild west rodeos, road trips to fascinating festivals and live sporting events to the great outdoors. The planner has a practical map of the United States of America that puts locations and transport options in perspective. The Visit USA Travel Planner can help you plan and organise the trip of a lifetime. The Visit USA Travel Planner is created by the Visit USA UK Association, which brings together a large group of members including US State Tourism Offices and Destinations, Specialist Tour Operators, Attractions, Airlines, Hotel Groups and many other specialist travel providers, and works to offer UK travellers the best possible experience when they visit the USA. Once you have read the guide remember to take a look around the website for more inspiration in our regularly updated Blog, ideas, offers, brochures and videos from our members. We have made the information easy to find whether you are looking to explore a particular US State, or you know the type of holiday you want there’s a simple way right here to find the information you need to plan your next trip. Enter your details in the boxes and we’ll send a print version of the planner to you. NOTE: We can only send printed copies of the travel planner to addresses in the UNITED KINGDOM. By providing your email address and clicking “Request Travel Planner” you consent to be contacted by Visit USA with offers and updates which we feel may be of interest to you. To opt out, use the unsubscribe link or email info@visitusa.org.uk. Find out how Visit USA safeguards user information by reading our Privacy Statement. Please note, that brochure requests cannot be fulfilled from addresses outside the United Kingdom. General tourist information on the USA and details of companies offering USA travel products or services, may be available from the US Commercial Service office at your local U.S. Embassy. They will also be able to advise you if a Visit USA office operates in your country.